Former Derry City defender, Mark McChrystal, today terminated his four year association with Bristol Rovers by mutual consent. An ex-captain of “The Pirates,” the 32-years-old, who led Rovers to promotion in consecutive seasons, is understood to be weighing up his options having negotiated a release from his contract at the Memorial Stadium. Having arrived from Tranmere Rovers, McChrystal struck up a solid partnership with Tom Parkes in the heart of the Rovers defence and had proved a popular player. And when Darrell Clarke took over the managerial reins at the Memorial Stadium, one of his first actions was to hand McChrystal the captain’s armband. 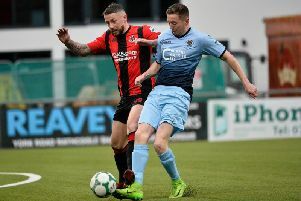 The former Northern Ireland Under-21 skipper, who represented his home town club Derry City, on three separate occasions in the League of Ireland, returned to both England and Scotland to further his career. Therefore, it’s not beyond the bounds of possiblity that the strong centre-back could see his future at home in either the Irish League or League of Ireland.